Choose a durable floor covering. Dirty shoes and spills are inevitable, even with adults. One practical option is to use modular flooring that allows you to replace a square instead of the entire carpet. Keep furniture choices simple. 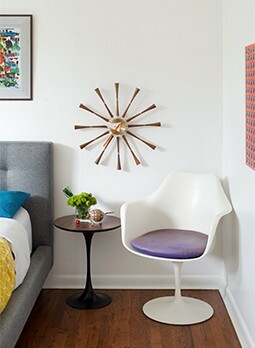 The clean low-profile lines of many MCM furniture pieces are perfect for the smaller-statured crowd. It will be accommodating to their needs, and to your desire for an artful play area. Include period-specific toys. Whether they are vintage toys, or reboots of the classics, they would be a perfect touch, tip-of-the-hat, to the midcentury generation. If it was good enough for the Boomers, it’s good enough to create some playful noise with today’s kids. Splurge on a fun color. You may have subdued colors throughout the house, but the playroom lends itself to fun. Paint a wall red, orange, turquoise or whatever makes your playful side come out. Select paints that allow you to easily clean up messes. Steer clear of flat finishes that hold onto stains, and choose satin finishes or higher which foster easy wipe-ups. Invite others to enjoy. Now that you’ve created a safe, fun and inviting play area all you need to do is populate it with play-date revelers. Exercise the usual and customary discretion, but rejoice in the notion that now you don’t have to worry about ruining your décor. You can get the MCM look without destroying your dreams. With these playroom ideas, your child will enjoy the colorful room you’ve created and grow up knowing the basics of good design!